I sleep with three different pillows. The one for my head is regular sized, with foam filling, and rather flat because I like to sleep with my arm under there. The one on my left is also foam, but a body pillow. The one on my right is king-sized and filled with down. I like to sleep on my side pressed between the two, and through the night, I’ll alternate between sides, hugging one. When she comes over, she takes the king-sized one. My head pillow is too flat, and obviously my body pillow is too big. So I lose my king-sized, and she becomes my replacement pillow. In terms of presents, the Christmas season has been good to me. Even though I decided not to do gifts for anyone this year, that doesn’t stop people from buying me things. Along with a Mexx gift certificate, Eagle vs. Shark on DVD, and an electric hot rod that I can build, I got some great gifts. My first Christmas stocking since leaving home. 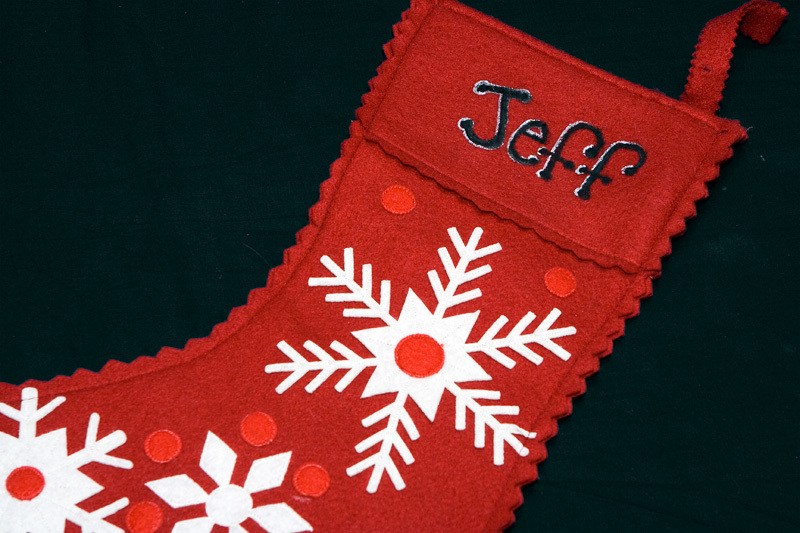 I used to have a stocking that my grandmother knit back when I was one (if I remember correctly), which had my name on it, and Santa bending over putting something down, but looking at the viewer as if he was caught in the act of delivering presents. Instead of a star or angel on top of the tree, it would be my stocking. Since my grandmother was very much Chinese and not born into this culture, I always imagined her saying, “Silly white people and their silly mythical fat people”, while knitting it. I admit that I not only save other people’s posts, but entire blogs. Sometimes, there are entries I like to read over again. Other times, I just like to be reminded of how right I was. But more often than not, it’s the ephemeral nature of blogs in general, combined with the fickle nature of adolescent writers still trying to “define themselves” on a free medium, that gives me the itch to save. So many writers I used to follow have changed domain names, started protecting their entries, or deleted their blogs. Some things are garbage and should be forgotten or thrown away — but some things deserve to be kept too. Word-for-word, exactly the way it was spoken, because that’s the way it was expressed. Fortunately, or unfortunately, depending on your point-of-view, our words do last. Just because they aren’t there anymore, doesn’t mean they were never spoken. There are consequences to the things we write, whether we want them or not. January 23, 2009 Random Enter your password to view comments.